Help us by clicking a link and adding any item to your cart at Amazon within 24 hours, and we will earn a small referral commission. Below are search results for Adventures of a London Doll by Mrs Fairstar at Amazon. You can visit Amazon to customize this search. Below are search results for Adventures of a London Doll at Alibris. You can visit Alibris to customize this search. 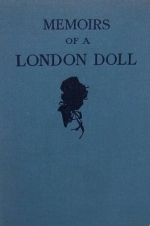 Below are search results for Adventures of a London Doll by Mrs Fairstar at AbeBooks. You can visit AbeBooks to customize this search. Below are search results for Adventures of a London Doll audiobooks at iTunes. Browse iTunes to customize this search. Below are search results for Adventures of a London Doll ebooks at Apple Books.